This piece is on Pastelmat, which is soft and absorbent and slightly fuzzy. The gouache soaks into the wet fibers and spreads out, sometimes alarmingly independent of my control. But once the first layer dries, the stiff fibers take on a lovely texture and accept lush brush strokes or dry brush treatment well. I find I can tame the accidents, add a certain amount of detail, and add gestural bits that please me. Painted in gouache on Pastelmat, 2.5" x 3.5". I'm happy with the foreground plane here, as I like the complex and subtle colors. How do you describe a purple green? But that's what it is. 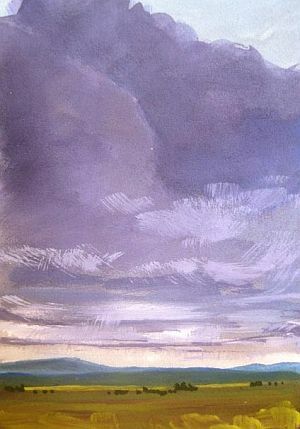 Of course, the looming purple cloud sets the mood and tone. A friend shared this photo with me (thanks Geraldine!) I reinterpreted it a bit. 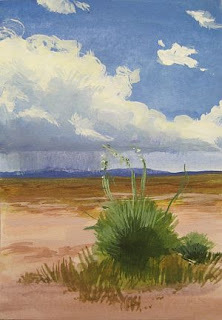 I love the here-and-there subject matter, the soft cloud and sharp cactus reaching out in opposition to one another. It's so typical of New Mexico in July: hot and dry, with the promise of cool rain to come.